In the name of God amen. The twenty-eighth day of December in the year of our Lord God one thousand six hundred fiftie and one. First and principally I commend and bequeath my sole to Almighty God hopeinge steadfastly by the merits of the death and passion of our Lord and Saviour Jesus Christ, to be one of the number of his elect, and my boddie I bequeath to the earth, to be decently buried, in Christian burial in the usuall burial place in Bunburrie Church, at the discreation of my executor, hereafter and here in mentioned and named: and as touchinge my worldly goods and substance. First I give and bequeath unto my eldest sonne, George, all my lands as they shall fall, and further, I give him all my rings or jewels, my armor, and my sword and belt. And for my debts I owe twentie pounds unto one Master Beeston of London which I do give my sonne George paye as soon as conveniently he may. I give and bequeath unto my daughter, Penellope, twelve pence. I give and bequeath to my second daughter, Mary, two hundred pounds to be paid out of my wife’s joynture as soone as possible it may be raised, and in case my father dye then out of the whole estate sooner if it may bee. I give and bequeath to my third daughter, Ann, two hundred pounds more to be payed out of the same lands, next and immediately after Mary. I do likewise give and bequeath unto my forth daughter, Elizabeth, one hundred and fifty pounds more to be paid in like manner next and immediately after Ann. And for my younger sonnes, I give and bequeath to my second sonne, John, fifteene pounds per annum to be paid him in money duringe his life by equall portiions videlicet [clearly] seven pounds and ten shillings at the feast of John the Baptist and seven pounds and ten more at St. Martin the Bishop in winter and this to be paid out of the charge of the whole demesne lands. I give and bequeath to my sonne, Peter, fifteene pounds more to be paid him in like manner during his life in manner and form as before to my son, John. I give and bequeath to my sonne, Charles, fifteene pounds per annum during his life to be paid as aforesaid and out of the same lands and in the same manner as the rest. And further, my whole will and pleasure is that all my instant goods moveable and unmoveable, except my cart horses and furniture with half a bay of wheat which I desire may be sold for the present maintenance of my younger children: Bee equally divided betwixt my two daughters, Mary and Ann, at the oversight of my feeoffees [deed or gift of land] hereafter and herein mentioned and named. And my will is likewise that my six kyne [cows] be kept for the relief and mayntenance of my younger children to give them milk for long as they shall agree togeather or until some further course be taken with them, and then my will and pleasure is that two of these kyne be taken out from the rest and one of the two I give and bequeath to my sonne, John, and the other I give and bequeath to my sonne, Peter, and for the other four I give and bequeath two of them to my daughter, Mary, and the other two I give and bequeath to my daughter, Ann. I give and bequeath to my man, William Ratcliffe, my cloth cote and for the rest of my wearinge clothes to be equally devided betwixt my three sons, John, Peter and Charles. And of this my last will and testament I make and ordayne Edward Minshall of Stoke, Esquire, and my brother-in-law, Richard Robbinson myne executors……. George Spurstow was the son of George and Elizabeth Anne Spurstow of Spurstow in Cheshire near the village of Bunbury. The church of St. Boniface was the village church and where many in the Spurstow family were christened and buried. This George was christened in 1605 and, despite sources that give his death date as 1669 and his wife as Susanna Corbet, he died in 1665, when his will was probated, and the name of his wife is unknown. In the will, no wife is mentioned, but all his living children are, starting with his eldest son George (line21), his daughter Penelope (line 27), and then listing the rest of his daughters in order followed by the rest of his sons. 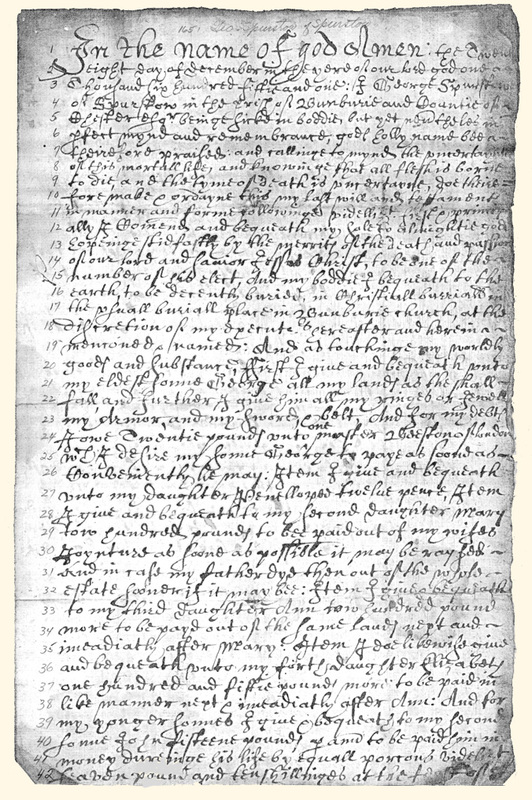 Only the first page of the will is shown above. There are two more pages. Following the will are two documents dated in May and June 1665 having to do with his executors. George was probably buried at the church in Bunbury as he requested in his will but not record of his burial has been found yet. For more on this George and how he has been confused with his son, George, born 1634, see the explanation of the Errors in the Spurstow family tree.